The Ladies Library Association of Greenwood established the Greenwood Library in November 1901 to promote the reading of great literature by the citizens of Greenwood. The Association held ice cream socials and hot suppers to raise money for books. Members asked their families and friends to donate books from their personal collections. When the Library opened, it had less than 150 books and a set of encyclopedias. Membership cost .50 and was available only to residents of the city of Greenwood. The Library Assocation decided to open its membership to residents of Greenwood County in 1902, and charged $1 for a membership to residents who lived outside the city limit. The Library was located over Bolton’s Store at 413 Main St. across from where McDonald Patrick Law Offices are now. The Ladies Library Association had very little money, and used most of the funds it raised to purchase books. Bolton's Store donated the use of its upstairs to the Library Association, but the Association was responsible for paying the utility bills. The members decided to save money by not using electricity. Association members opened the library two afternoons a week from 2 p.m. until dark. Library use continued to grow, and by 1915 the Library had outgrown its room. It was time to find or build a facility to house the collection. The Association felt the library should be centrally located with a low rent. No existing buildings were available on those terms, and the Association decided to apply for a Carnegie grant. They approached several of Greenwood's prominent men, and, through their influence, the City of Greenwood agreed to donate the land for a new library. Greenwood County Government agreed to provide financial support for a new library. With these key pieces in place, the Ladies Library Association had the local support it needed to apply for a grant from the Carnegie Corporation of New York. As a boy, Andrew Carnegie immigrated to the United States from Scotland. He landed in Pittsburgh and worked long hours at his job. There was no time for him to attend school, and he educated himself by borrowing books from a library established by a local merchant. When he achieved financial success, he became a philanthropist and provided funds and blueprints to build public libraries throughout the English - speaking world, saying "...I decided there was no use to which money could be applied so productive of good to boys and girls who have good within them and ability and ambition to develop it, as the founding of a public library in a community..."
The Ladies Library Association succeeded in getting a Carnegie grant of $12,500 to build Greenwood's first library on the site of the present Greenwood County Courthouse. When it opened in 1917, the Association turned its operation over to Greenwood County and bowed out. The building served Greenwood County through 1958. Library use continued to grow, and two important changes took place. First, the Kiwanis Club of Greenwood renovated the basement of the library in 1928 to make a children's room. The Club donated 500 children's books and furniture to the room, and guaranteed the salary of a Children's Librarian for five years. The second change resulted in library services made available outside the building. The Association of Farm Women worked with the Library and the South Carolina State Library to purchase the first bookmobile in 1932. The bookmobile made it possible to reach families and children who lived more than five miles away from Greenwood. The Carnegie building had become too small to hold the collection, staff, and users by 1950, and the Children's Room was prone to flooding during heavy rainstorms. It was time for a new building. Mrs. Porcher, the library director, looked for a new site. The old First Baptist Church had been condemned as unsafe in the mid-1950's, and its congregation had moved to its current location on Grace Street. Mrs. Porcher decided that the old church location on Main Street and Bailey Circle would be the best site for a new library. Greenwood County Council provided the funds to purchase the property from the church and build a new library. A new building was erected on the old church foundation, and opened in 1958. It was expanded and renovated in 1976, and served Greenwood until 2010. Library use continued to grow, and by 1997, it was clear that the building didn't have enough space for materials, computers, library users and staff. A penny sales tax was passed, and the construction of a new library was included as one of two projects. A capital campaign began in 2007, and corporate and family foundations as well as private citizens gave $2.5 million towards the construction of a new library. Through of combination of the donation and purchase of land, the library was able to get a 5 acre site at 600 South Main Street. Construction on a new facility began in 2008 and was completed in 2010. At 43,999 square feet, the new facility was more than double the size of the old library building. The new facility opened October 3, 2010. Library use more than doubled as Greenwood County residents flocked to the new building. 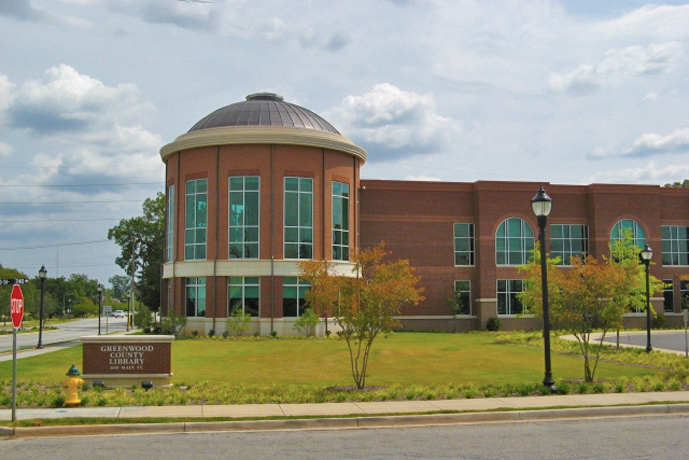 The new Greenwood County Library was awarded LEED certification at the Silver Level in 2011. It was the first public library in South Carolina to receive LEED certification. The Greenwood County Library, along with its branch libraries in Ninety Six and Ware Shoals and through its bookmobile, continues to serve Greenwood County's citizens. Its mission is to help all Greenwood County citizens be more connected, informed, and entertained through free access to its resources and programs.